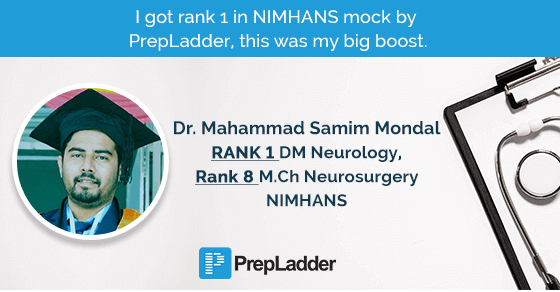 PrepLadder congratulates Dr. Mahammad Samim Mondal on securing Rank-1 in DM (Neuro) and Rank-8 in M.Ch Neurosurgery, NIMHANS. We wish him all the best for his career and future ahead. Hi. I am Dr. Mahammad Samim Mondal. I graduated from Burdwan Medical College, West Bengal in 2017. I scored Rank-1in DM (Neuro) and Rank-8 in M.Ch Neurosurgery, NIMHANS. What do you think is the correct approach to study for NIMHANS? Only MCQ's or Theory + MCQ's? Extensive theory with full understanding of topics is an ideal approach to study for NIMHANS. Don’t mug up MCQ’s. It should be practiced just to assess your knowledge. Radiology: Arora, Fundamentals of Radiology. Yes, I have attempted AIIMS,NEET PG & PGI exam held in 2017. Localization in neurology is just like maths. So, you can understand how much to practice. Learn from your mistakes, be a learner first then you will surely be a ranker. Did PrepLadder play a part in your success? If yes,how? I got rank-1 in NIMHANS mock by Prepladder, this was my big boost. NIMHANS series by the legend Omkarnath himself was a mind-blowing approach to solve tricky and previously asked questions. My sincere thanks and respect to Dr. Omkarnath, you gifted me Your book, it’s awesome sir. Yes, I always used a study plan to keep my preparations on track. It is mandatory for self assessment of daily activities. Yes, Topper in Final MBBS from my college and PG oriented. Nothing is difficult because if you love something it will love you. I felt Community Medicine as the easiest. Don’t mug Up. Understand the topics, don’t just read notes, it will not help you. Notes provided by most of the coaching classes are review based. If you never understood the subject and concept, how can you review those topics? Remember, there is one "Re" in review. So view first, View is must. Build your concept; don’t waste your preparation time just mugging up coaching notes. Make your own notes only after clearing concepts then review those notes. It will give you highest yield. What was your exam taking strategy? I was less scared with the negative marking since only 1/4th marks are deducted if a question gets wrong. So, if you have any idea related to the question, you must attempt it. Fellow NIMHANS and other central Institute aspirants You can reach me through prepladder's mentorship programme, You can ask me any questions reagrding your preparation and strategies any time. And i will be there to answer it with genuine suggestions as soon as i can. Hope we will have great conversation ahead. Either You Win Or Learn How To Win Next Time. No Failure In Between, because Winning is Your Birth Right and You Shall ........................(fill this with your own results ). Best of luck. We thank Dr. Mahammad Samim Mondal for sharing his success story. To read success tips from Dr. Chirag, Rank 1 Neurosurgery NIMHANS, click here.